I thought this project would spin out longer, but the process of adding one piece, then another, is addictive. Like knitting. 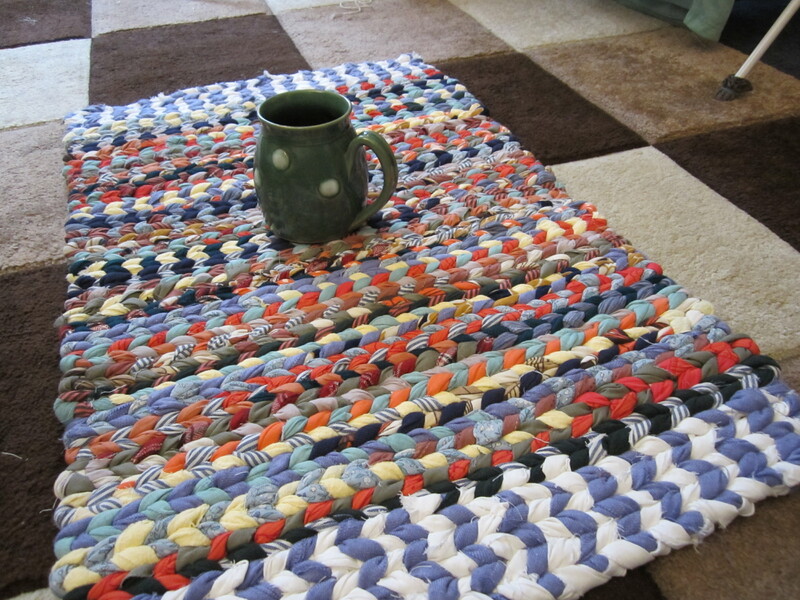 One other kind of rag rug, a twisted rag rug, caught my eye while I was working on that last rug (non-video tutorial here). It hovered in my mind for months. When I steeled myself to get rid of all the clothes I had been holding on to for one reason or another (surely it will fit again! or Just because you can see through the flannel doesn’t mean it’s worn out! or You’re never actually going to do the alterations on this, are you? ), they just arranged themselves so nicely in my head as a rug that I had to give in. I could never sacrifice yards of pristine fabric, but I feel no less compunction about chopping up clothes I would never wear again. Meet my loom, a.k.a. the top rack of my laundry rack. People who make more than one rug usually have a simple loom with a row of nails at each end to hold the weft, but I’m not one for extra equipment. 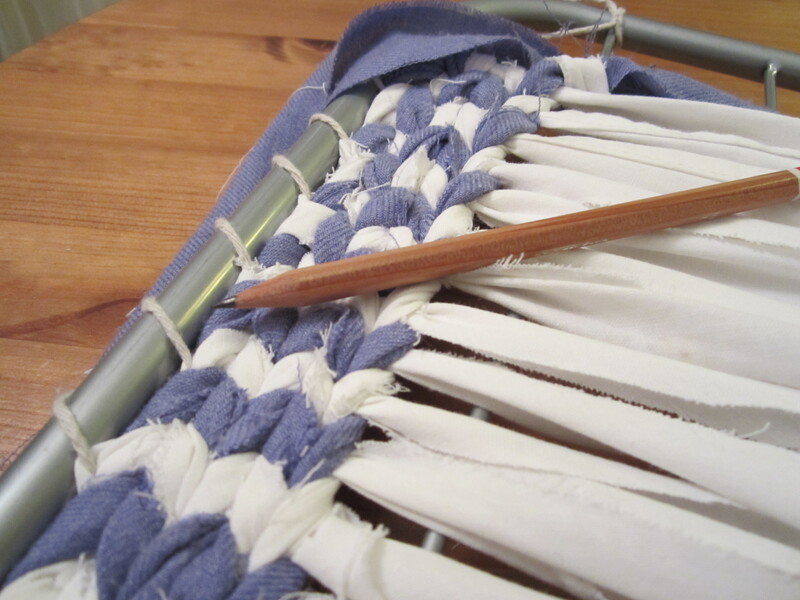 The weft is held to the ends of the rack by a spiral of string. 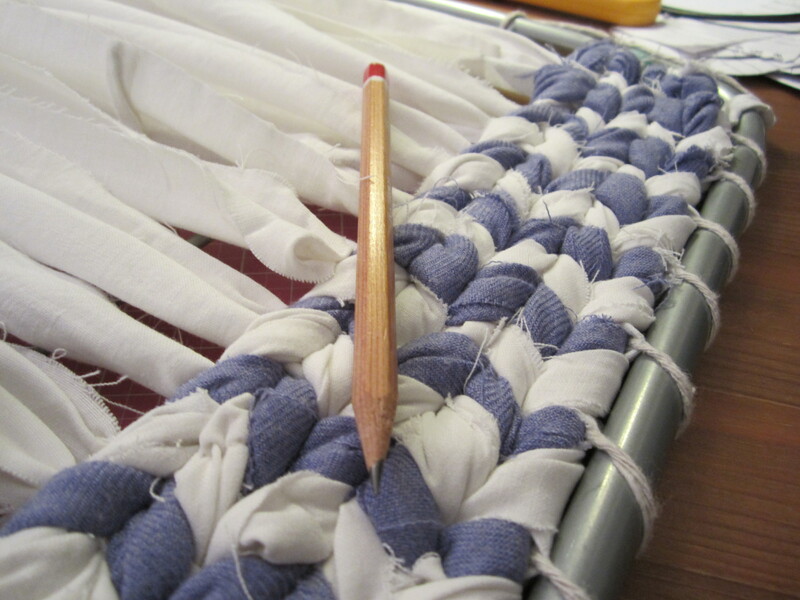 This is congruent with heritage weaving methods in a number of cultures. The loom is strung with 2-inch strips cut from a worn-out chemise that started life as a worn-out sheet. This fabric has really gotten around. 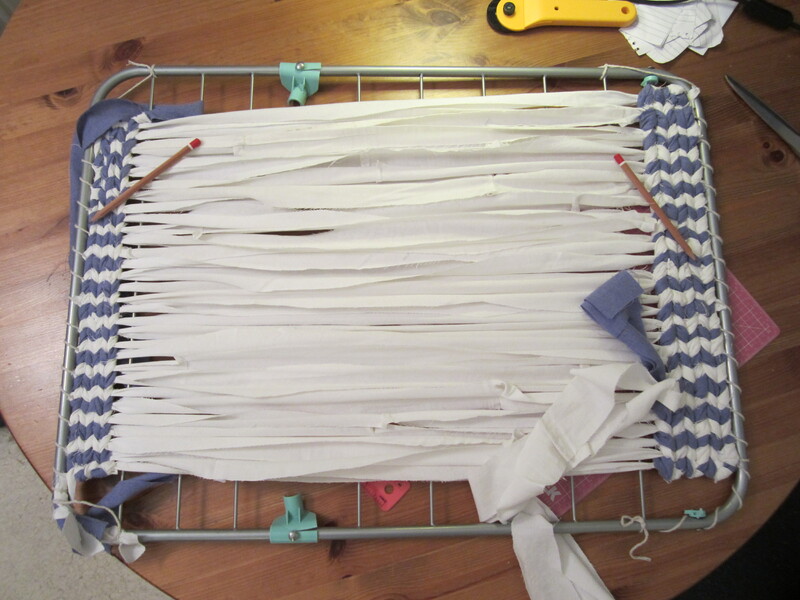 If I did it again, I would use 3″ strips of the sheet or 2″ strips of a sturdier fabric; the sheet strips tore through in several places. I fixed those spots with heavy thread and wove over them as usual. I tried two different widths of fabric for the weft, 2″ and 4″. The thinner strips gave a more elegant result, but the thicker strips resulted in a cushier rug. In hindsight, I think I could have spaced the warp (the long ones) a little further apart to compensate for the thicker weft. In the end, I tore out the section with 2″ strips. 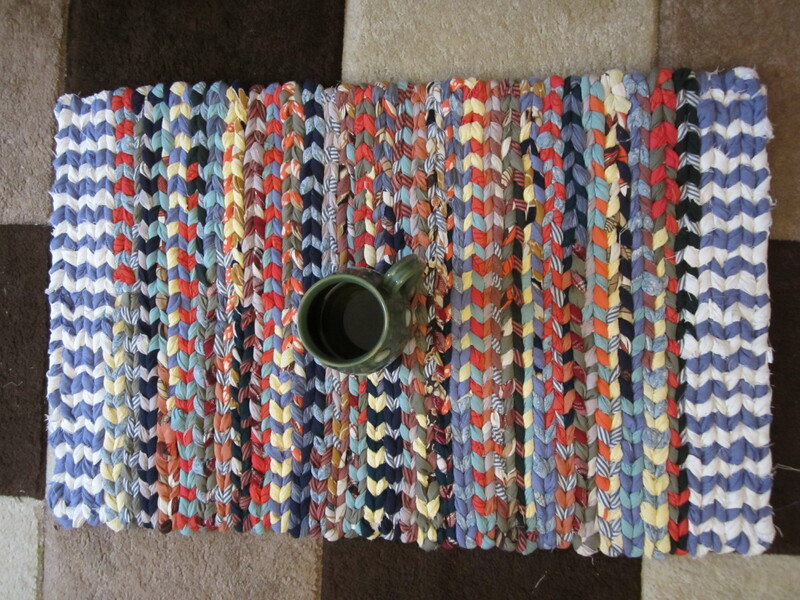 The fabrics for this rug were a motley selection from my own closet and my husband’s. There’s flannel and even striped polyester from some SCA garb (more bedding that’s been around), printed cotton dresses, viscose scarves that were pilling, flannel pajamas, t-shirts, long underwear and a too-small running shirt (that’s the bright pink). Knowing my favorite colors and patterns were going to add interest to my rug made it a lot easier to clear some prints and colors from my closet that I had been holding on to for a while just because they were pretty.